Easter is almost here. Today I wanted to share with you some fun fine motor and sensory kids activities for Easter that are easy to do for all ages. Lots of great ideas here for toddlers all the way up to elementary school age kiddos. Last week I shared a post on teaching the true meaning of Easter to our kids. I definitely think that should be the main focus of Easter. There are so many fun activities out there though for Easter that have to do with bunnies, eggs, and jelly beans that I decided to do a round up of my favorites. These activities below are still fun to add into your child's week, especially right before Easter. For more fun fine motor and sensory activities you can follow my Pinterest boards below. 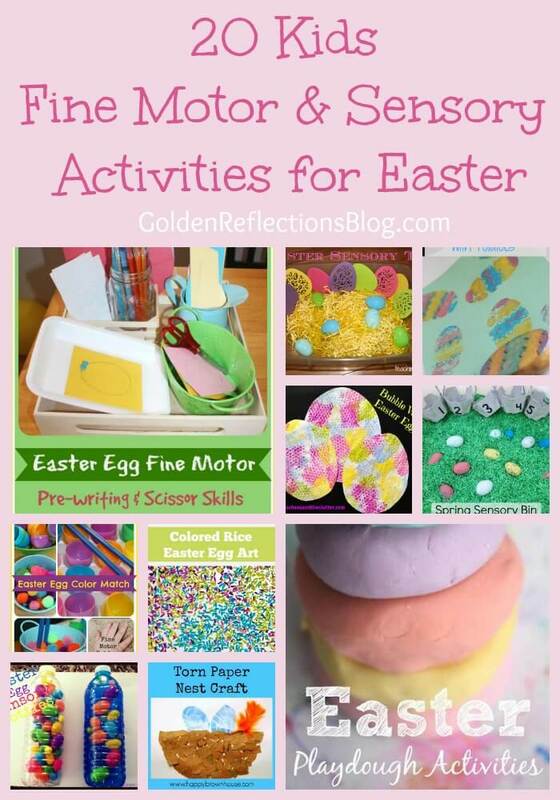 Follow Heather @ Golden Reflections Blog's board Spring Fine Motor Activities on Pinterest.